Delivering the highest color quality requires a good color measurement solution. The X-Rite eXact handheld spectrophotometer takes color measurement and management to the next level. It is a scalable platform that can be field upgraded as needs change, from a simple densitometer to a highly advanced spectral measurement instrument. X-Rite eXact enables printers and packaging converters to truly understand, control, manage and communicate color across the entire color network and avoid unwanted reprint and rework. X-Rite eXact Standard: A spectrophotometer that ensures accurate printing of both CMYK and spot colors as well as leveraging industry standards for process control. X-Rite eXact Advanced: A spectrophotometer for ink labs, quality control and manufacturing partners who must achieve the highest quality with the broadest toolset. 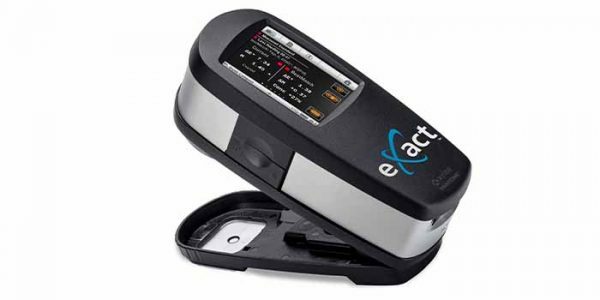 For accurate color measurement on flexible film, the X-Rite eXact is also available in Xp models for eXact Densitometer, eXact Standard and eXact Advanced. The M3 Polarization Filter option is not available for eXact Xp models. X-Rite eXact also includes eXact Manager to set several different configuration options in the eXact; eXact DataCatcher, for the capture of spot measurements from eXact instruments and transfer of data to an application such as Microsoft Excel; and eXact DataMeasure, to measure in Scan mode and transfer data to an application such as Microsoft Excel. Designed to meet standards and tolerances, no matter how exacting. Supports all leading print specifications so printers and converters can efficiently monitor color processes. eXact’s BestMatch function helps press operators keep color on target even before color shifts are visible with recommendations for ink adjustments to achieve the best match, reducing waste during press runs. A choice of four different aperture sizes (1.5, 2, 4 or 6 mm) to enable measurement across a wide range of applications in print and packaging. When used with NetProfiler, eXact can manage and monitor color performance on an enterprise level, providing consistent quality measurements across shifts departments and sites. The only instrument on the market that can capture M0, M2 and M3 measurements in a single pass AND measure true M1 Part One as specified in ISO-3664. By deploying X-Rite eXact spectrophotometers, print and packaging operations can significantly reduce makeready times, improve quality, reduce substrate and ink waste and enjoy a more efficient workforce. It is the first instrument in the marketplace to combine unique hardware and software into a single integrated, scalable solution that helps operations get color right the first time, right every time.